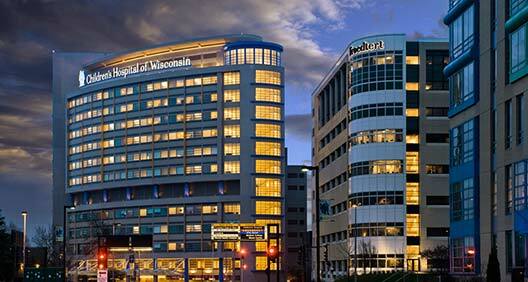 Children’s Hospital of Wisconsin is one of the nation’s top pediatric hospitals, ranked 4th in the country by Parents magazine and in all 10 specialties by U.S News & World Report. We have over 500 pediatric-trained doctors who see kids of all ages for everything from serious procedures to routine checkups. And we complement our nationally-ranked clinical care with robust community support programs that keep kids safe and healthy. We are the region’s only independent health care system dedicated solely to the health and well-being of children. In Milwaukee and throughout the state, we provide kids and their families a wide range of care and support – everything from routine care for ear aches or sore throats to life saving advances and treatment options. Our academic partner, The Medical College of Wisconsin, brings many of the nation’s most well-respected doctors to our team. Together we work to ensure that every child and family we serve receives nothing but the best. Every day, we are working to advance our vision – that the kids of Wisconsin will be the healthiest in the nation. We know that kids need healthy families and strong communities to live well, and that we can’t do it all alone. Because of this, we partner with and support the community in many ways. We invest millions of dollars every year to keep Wisconsin’s kids healthy, happy and safe.